There are 37 Assisted Living Facilities in the Cedarburg area, with 3 in Cedarburg and 34 nearby. The average cost of assisted living in Cedarburg is $5,535 per month. This is higher than the national median of $3,346. Cheaper nearby regions include Grafton with an average starting cost of $4,136. To help you with your search, browse the 103 reviews below for assisted living facilities in Cedarburg. On average, consumers rate assisted living in Cedarburg 3.3 out of 5 stars. Better rated regions include Grafton with an average rating of 4.3 out of 5 stars. Caring.com has helped thousands of families find high-quality senior care. To speak with one of our Family Advisors about assisted living options and costs in Cedarburg, call (855) 863-8283. Located 20 miles northwest of Milwaukee, the city of Cedarburg, Wisconsin is a charming community that boasts a rich history and vibrant arts scene. Of the more than 11,000 residents who call this city home, 17.3 percent are aged 65 and older, and may benefit from the daily assistance and care offered by assisted living programs. 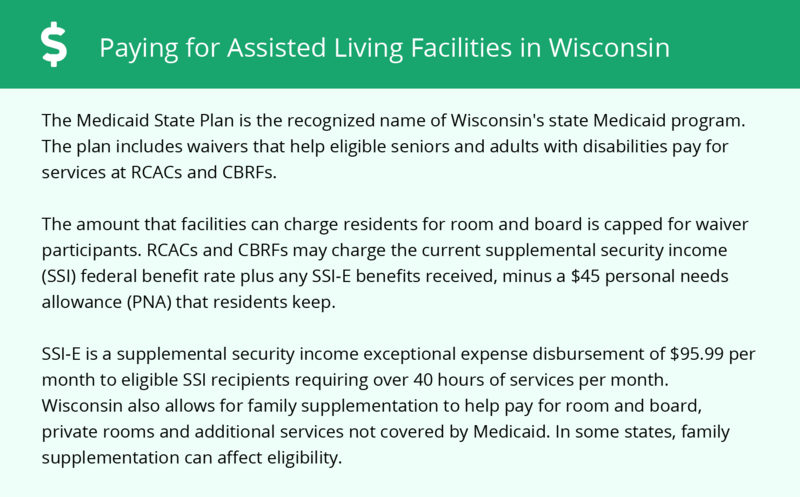 Wisconsin recognizes four types of assisted living programs: community-based residential facilities (CBRFs), residential care apartment complexes (RCACs), adult family homes, and adult day care, all of which are licensed, registered and certified by the Wisconsin Department of Health Services. A total of 45 of these facilities are available in Cedarburg and its neighboring communities. Cedarburg has a rich cultural history and a number of arts and entertainment opportunities for seniors to enjoy, including a number of art and history museums, such as the Wisconsin Museum of Quilts and Fiber Arts, historical houses and several annual festivals held throughout the year. While many Wisconsin cities are less expensive than the average U.S. municipality, the cost of living in Cedarburg is much higher. Based on the U.S. national average of 100, Cedarburg's overall cost of living is given an index rating of 122.4, which seniors may want to consider when budgeting for care services. If safety is a concern, Cedarburg may be a great choice for seniors as crime rates are very low. Violent crime is rated 7.3 and property crime receives a 19.3, both scores out of a possible 100, with 100 representing high crime. Winters in Cedarburg can be quite harsh, which may be difficult for seniors. Temperatures can drop below 12 degrees, and residents can expect to see roughly 48 inches of snowfall. Though Cedarburg does not have a dedicated public transportation system, seniors in Ozaukee County have a number of transportation options to travel both locally and to nearby communities. These include the Cedarburg Senior Center Van Service's curb-to-curb transport, Ozaukee County Shared Ride Taxi service and Ozaukee Family Services transportation service. The Cedarburg area is home to world-class medical facilities, including Ascension Columbia St. Mary's Hospital Ozaukee and Aurora Medical Center Grafton, in the event of medical emergencies or illness. Assisted Living costs in Cedarburg start around $5,535 per month on average, while the nationwide average cost of assisted living is $4,000 per month, according to the latest figures from Genworth’s Cost of Care Survey. It’s important to note that assisted living rates in Cedarburg and the surrounding suburbs can vary widely based on factors such as location, the level of care needed, apartment size and the types of amenities offered at each community. 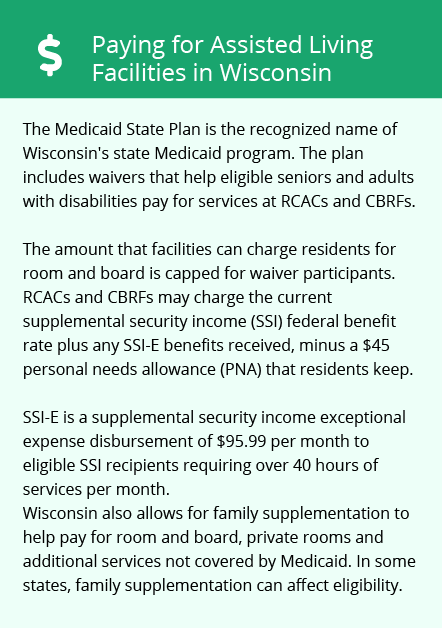 In addition to Medicaid waiver programs, seniors in Wisconsin are able to receive additional assistance from non-Medicaid state-funded programs, including the Community Option Program and Supplemental Security Income exceptional expense (SSI-E) payments, to help finance the high costs of assisted living services. More information about programs and financial assistance options can be accesed via the Aging and Disability Resource Center (ARDC) of Ozaukee County. Cedarburg and the surrounding area are home to numerous government agencies and non-profit organizations offering help for seniors searching for or currently residing in an assisted living community. These organizations can also provide assistance in a number of other eldercare services such as geriatric care management, elder law advice, estate planning, finding home care and health and wellness programs. To see a list of free assisted living resources in Cedarburg, please visit our Assisted Living in Wisconsin page. Cedarburg-area assisted living communities must adhere to the comprehensive set of state laws and regulations that all assisted living communities in Wisconsin are required to follow. Visit our Assisted Living in Wisconsin page for more information about these laws.